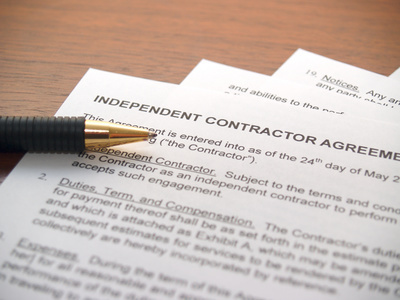 A worker enters into an independent contractor agreement with a company to provide some general maintenance work. But then after the worker is injured in an accident, he claims he is entitled to disability benefits as an employee of the company, along with some unpaid overtime. Is there any way for him to make such a claim? Possibly so. The Seventh Circuit Court of Appeals just reversed a lower court’s award of summary judgment to an employer in a case involving similar facts, finding that whether the worker was actually an independent contractor or employee was a factual issue to be determined at trial. Simpkins v. DuPage Housing Authority, et al., Case No. 17-2685 (7th Cir. June 20, 2018). Anthony Simpkins entered into an independent contractor agreement with DuPage Housing Authority (DHA) in November 2009 to do some carpentry, maintenance and handyman work related to DHA’s rehab of some properties. When that project was done, Simpkins started doing some general maintenance work at some of the communities managed by DHA. In 2012, DHA and Simpkins entered into another independent contractor agreement in which the scope of work was described as “general labor for maintenance.” Simpkins worked exclusively for DHA from 2009 through 2015. DHA paid him on a bi-weekly basis and issued him 1099s to file his taxes. Simpkins repeatedly asked DHA to make him an employee instead of an independent contractor. In May of 2015, Simpkins was injured in a car accident. Simpkins filed a lawsuit against DHA, claiming that he was entitled to certain disability benefits as an employee of DHA, along with unpaid overtime. DHA sought summary judgment, arguing that Simpkins was not an employee. The district court agreed, but the Seventh Circuit reversed, finding that there were genuine disputes of fact that are material to the determination of Simpkins’ employment status. As the Seventh Circuit explained, the question of whether a worker is an employee involves the consideration of a number of factors, with the ultimate goal being figuring out what is the economic reality of the working relationship. What it came down to here is that there were several factual issues in dispute. Simpkins claimed that DHA required him to work certain hours, even though DHA disagreed and said it was up to Simpkins how and when he got tasks done. Simpkins claimed that DHA provided him with all of the tools he needed, but DHA argued that this was not the case, pointing to Simpkins’ tax returns in which he itemized certain purchases of materials. DHA also argued that Simpkins had specialized carpentry skills, while Simpkins claimed he was just responsible for performing rudimentary tasks for which no special skill was required. There were also some inconsistencies within the independent contractor agreement itself. In light of all of this, concluded the court, there were factual disputes that meant that summary judgment was not appropriate. Employers cannot rely on the fact that they label a work an independent contractor, even if the worker signs an independent contractor agreement. If the worker later comes back to contest his or her status, what is going to matter is the actual relationship between the parties and not the title given to the worker, even if agreed upon.